What Is a Rest on a Partial Denture? Denture base-the part that is adapted to the soft tissues in the region of missing teeth and will be used to support the fake teeth. Direct retainer-parts of the denture that prevents the denture from dropping out of the mouth. Clasps are often used as a direct retainer. Indirect retainer-parts of the denture that prevents the denture from rocking or shifting sideways or rotating during eating or talking, eg: rests. We will be focusing on rests in this article. A rest is a small projection of metal from the main frame of the body of the denture (the major connector) that rests on the chewing surface of a natural tooth, usually the tooth next to a gap. Placement of a rest requires that a little bit of tooth structure (only enamel) is removed using a small dental bur, to create a space so that when the metal projection from the denture (which will conform to the shape of the prepared area) rests on that tooth, the patient will not feel a “high bite” when they bite their teeth together. If a denture base rests entirely on an edentulous ridge (the region where teeth has been extracted) without a rest, all the load during chewing in that region is transmitted to the bone within the edentulous ridge. This type of denture support is called “mucosal support”. This kind of support is detrimental to the edentulous ridge, and may result in a faster rate of resorption of the ridge. Therefore, a rest is usually placed on a tooth on each side of the gap so that the load is shared out between the 2 teeth, which are better at withstanding the load of mastication (chewing). This kind of denture support is called “tooth support”. In cases where the last few teeth are missing, a rest is placed only on the natural tooth in front of the gap, and the load in function is shared out by both the natural tooth and the ridge. This is called “tooth and mucosal support”. 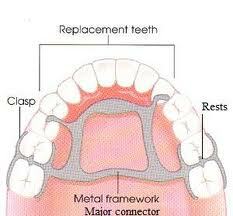 Wherever possible, the denture should be “tooth-supported” through the use of rests. What are the functions of a rest? Transmit axial loads (vertical loads) to natural tooth, as mentioned in “tooth support” above. 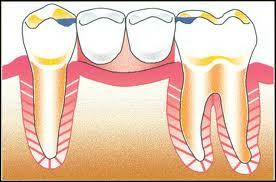 This also helps to prevent extrusion, tipping or migration of the natural tooth adjacent to the missing teeth. By being rounded in shape, it helps to deflect food away from the junction between the fake tooth and its adjacent natural tooth. 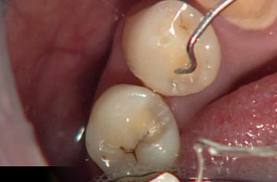 This is important as food can get easily trapped in this junction and lead to plaque accumulation. Maintain clasp-to-tooth relationship: A rest is most often included in a clasp assembly to prevent displacement of the clasp into the gums, i.e. the rest maintains the level of the clasp at which it engages the tooth surface. Other functions: Serve as a reference pointfor evaluating fit of framework on the teeth. What are the design criterias of a rest? Rigid– they are made of the same metal as the major connector (chrome cobalt). Rounded to permit movement in function, hence the typical “spoon-shaped” preparation on the natural tooth. Forms an angle of less than 90° with the minor connector (the vertical metal that connects it to the major connector). This is to transmit vertical load along the long axis of the tooth and not in any other direction. What are the different types of rests? Cingulum rest– placed on an upper incisor or a canine, resting on the cingulum (the bulge on the palatal side) of the tooth. Incisal rest-placed on lower incisors, where the enamel is too little that preparation of a cingulum rest might penetrate beyond the enamel. It is the least aesthetic type of rest as it can be seen from the front. What Is the Difference in a Dental Bridge and a Removable Partial Denture? This entry was posted in Denture and tagged cingulum rest, incisal rest, indirect retainer, occlusal rest, Rests, support on September 24, 2011 by phebe.